The year is 1945. There’s snow on the ground, and Memorial Union’s Great Hall is full of Wisconsin Union Directorate (WUD) student leaders and our staff and faculty spreading holiday cheer. A meal of rare beef, peas and bread, which is to be eaten solely with a knife, is served to 180 dinner attendees, who worked all year to provide the community with an enjoyable Wisconsin Union experience. Our Annual Beefeaters Banquet is underway. To answer this, we have to begin with talking about a place thousands of miles from the Union’s famous Memorial Union: the Tower of London. Beefeaters is the nickname for the Tower’s guards, who, as part of their salaries, were served beef for dinner, which was thought to be able to keep them strong and alert for their important job. Even when the guards’ salaries became solely monetary, the name stuck. Three students in costume pose for a picture at a Beefeaters Dinner in 1965. So how did the term “Beefeater” become part of our organization’s traditions and history? The first Union director understood that our Union would not be what it is if it weren’t for incredible student leaders who create more than 2,300 events throughout the year. He believed student leaders are, in many ways, the Wisconsin Union’s Beefeaters; they act as protectors of our organization and our Union mission and values and the Union ideal that our community experience learning outside of a classroom, just as the Beefeaters protect the Tower of London. Pictured are the 2017-18 student officers and directors at the 2018 Beefeaters Dinner. Each year, at the Beefeaters Banquet, we thank student leaders, who are leaving, for their service to the community and welcome those who are joining the Union in the year to come. The story of the Beefeaters at the Tower of London is read at a ceremonial student leadership change, as it has been since it began almost a century ago. Another thing has not changed about this gathering; beef is still served. 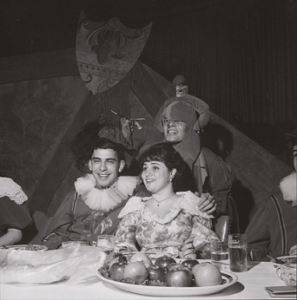 In the early years of this tradition, students and other attendees dressed in Tudor costumes and sang a holiday tune. 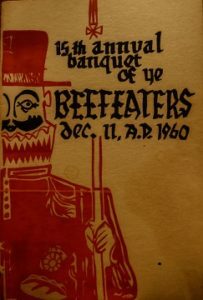 While this is no longer the case, many of the holiday traditions from Beefeaters Banquet continue through another event that is open to the public: the Tudor Holiday Dinner Concerts. These Concerts celebrate the Union’s warmth, fellowship and history, just as Beefeaters Banquets continue to do. We, at the Union, are also tied to London in another way; the first college unions originated there in the 1800s. The spaces began as places for debate clubs to meet, specifically at Oxford and Cambridge, and eventually evolved and became known as student unions. The Beefeaters Room is on the third floor of Memorial Union’s east wing. room the Beefeaters Room. A space named the Beefeaters Room can still be found on our historic building’s third floor is available for meetings as well as personal events. 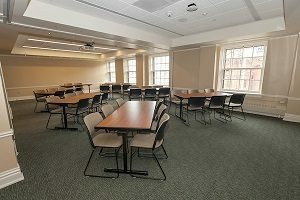 In fact, Wisconsin Union members can reserve this special space and the Union’s more than two dozen other spaces for free for personal use. In this room, you’ll find a display with Beefeaters mementos and history. We are grateful to the Wisconsin Union’s student leader Beefeaters past, present and future for their service and dedication. 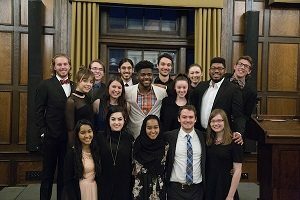 For, truly, without these talented students, all that we do at the Wisconsin Union would not be possible. Click here to learn about the many ways you can help make our student leadership opportunities, including by becoming a Wisconsin Union member (and enjoying all of the benefits that come with membership).